How do we form abstract concepts—like “dog”—given that we only experience concrete, particular objects—like “Fido”? 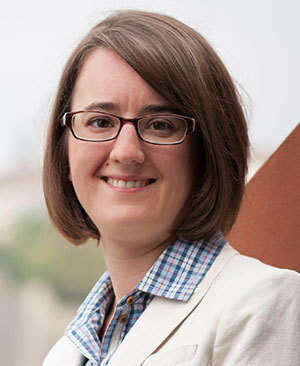 Her work, published in the Journal of the History of Philosophy, was awarded the publication’s 2015 best article prize in January. Cory argues that Aquinas uses what she terms the “active principle model” to explain the formation of abstract concepts. The concept of “dog” results from a chain of actions beginning with the object, Fido, and ending in a person’s mind. With the help of an “intellectual light,” the neurological impressions in an observer’s senses and imagination cause immaterial, abstract impressions such as “dog-ness” or “justice” in her immaterial intellect. Cory delved into theories of physical light that were circulating in European scientific circles at the time of Aquinas—the most important of which were the theories of Arabic philosophers Avicenna and Averroes. She discovered that Aquinas, drawing on these sources, was explicitly modeling the behavior of this mysterious intellectual light on the behavior of physical light. Cory said she hoped the award would draw attention to the new philosophical ideas that can be unearthed by reading classic figures such as Aquinas with attention to historical context. Originally published by Carrie Gates at al.nd.edu on March 29, 2016.